The United States is a culinary melting pot and it’s evident in the enduring popularity of the kolache, a type of pastry popularized by Shipley Donuts in Texas and other states. Indeed, these sweet and savory pastries appeal to kids and adults alike because of their delicious flavors, ease of eating, and affordable prices. But do you know where these treats came from and how these are made? While these things may not matter when you’re digging into your first box of kolaches, you will have a deeper appreciation for it, from its history to the care with which its bakers make them. Here’s a few interesting facts that you may want to know about the popular Czech import. The word “kolache” comes from the Czech word “kolo” meaning “wheel” or “circle” and it’s obviously a reference to the pastry’s round shape. Other spellings for the term include kolace, kolach, and kolacky although kolache is the most commonly used in the United States. Emphasis must be made that for the Czechs, there’s a distinction between kolaches and klobasniky, although both are considered as versions of the same type of pastry. While a kolache has non-meat fillings, such as dried fruits, cheese and nuts, a klobasniky has meat fillings like sausage. Essentially, kolaches are a semi-sweet dessert usually served during weddings in Central Europe while klobasniks are more savory. Both, however, are made from similar, if not the same, puffy dough recipes. Every self-respecting kolache and klobasniky baker rightfully takes pride in his or her dough recipe since it’s the soul, so to speak, of the pastry. There’s also an origin difference between the two versions. While Czech immigrants brought kolache to the United States, the Czech immigrants who settled in Texas were the first to make klobasniky. The kolache was first introduced in the United States in the mid-1800s, a time when Central European immigrants came in droves and settled in central and south-central Texas. Many of these immigrants chose the prairies and foothills regions of the Lone Star State and most of their descendants have remained in these areas, too. At the time, there were more than 200 Czech communities that brought with them their culinary traditions and passed them on the next generation. Even today, the popularity of kolaches remain strong and we have Shipley Donuts to thank partly for it, especially as the donut chain promotes its kolaches as passionately as its donuts. With Celebrations In the U.S. While Texas is the heart, if you will, of the kolache love, there are also other places in the United States that actually celebrate kolache day! These include Verdigre, Wilber and Prague in the State of Nebraska; Prague, Oklahoma; Cedar Rapids, Iowa under the auspices of St. Ludmila’s Catholic Church; and Haugen and Kewaunee in the State of Wisconsin. In Texas, the annual Kolache Festival is also happily celebrated in Caldwell, East Bernard, Crosby, and Hallettsville. Every one of these places claim to be the kolache capital of the state, or of the country, or even the world! Prague in the State of Nebraska even stakes a claim on having the world’s largest kolache. Many other communities with a strong Czech-American culture also celebrate kolache festivals. Such is the close association with Czech culture of the kolache that it was the sweet treat selected to represent the Czech Republic in the Café Europe program on Europe Day 2007. Today, the traditional kolache is undergoing an identity crisis of sort but it’s likely to make it more appealing to a wider audience. Where the traditional fillings are sweetened cheese or fruits, many bakers are now experimenting with other fillings, from the sweet to the savory. The traditional fillings include dried fruits, such as apricots and prunes, as well as poppy seeds, nuts, and farmer’s cheeses. The more modern fillings are nearly endless with each baker limited only by his imagination – sausage, Cajun sausage, sauerkraut with jalapeno cheese, Philly cheesesteak, chicken enchilada, bananas and Nutella, provolone cheese, grilled chicken, and eggs and cheese. 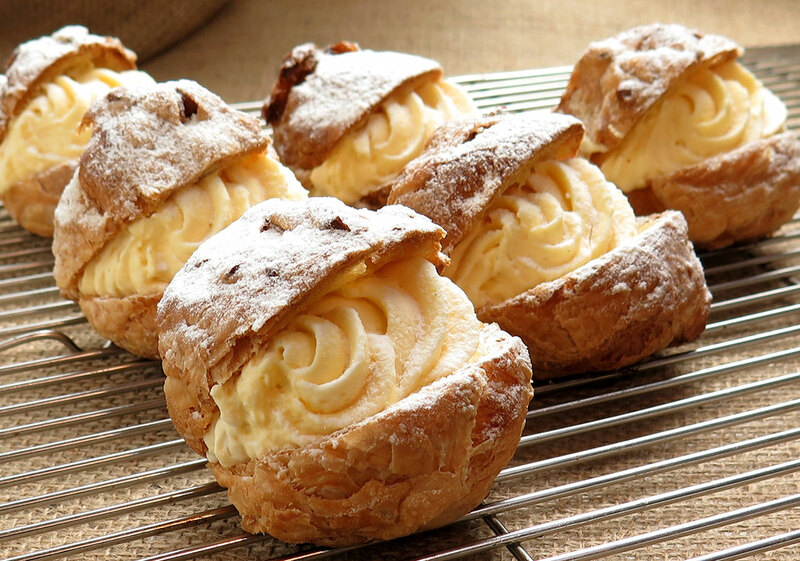 Even the shape can either be the traditional round as well as square and oblong (i.e., like eclairs). Like all beloved traditional food, every family, street corner, neighborhood, town and state has its own recipe for kolache and klobasniky! The evolution of the pastry has understandably been influenced and continues to be influenced by the people and places where it’s introduced. Despite these changes, fortunately, there are things that remain the same and that’s the yeasted dough. It should always be made from scratch using the freshest ingredients, made with care and attention to details, and made with patience. Indeed, it takes a few hours from mixing the ingredients and letting the dough rest to baking kolache before you can enjoy the final product. And don’t forget to enjoy both the traditional and modern takes on the kolache. You will find that you can eat them just about any time of the day and night, from breakfast to midnight snack.